Jake Carter is a 34-year-old farmer with 330 acres in McDonough, Ga. He grows fruits and vegetables and is the fifth generation of his family to work the land. "Farming was something instilled in me at an early age," said Carter, who lives on the farm with his wife and two young daughters. "I didn't know if this was what I wanted to do after college, but it's in my blood and it's hard to imagine doing anything else." As much as Carter says he loves his profession, he's knows he's part of a minority—being a farmer under the age of 50. According to the United States Department of Agriculture, the average age for a farmer is now 58 and has been on the rise for 30 years. There are now six times more farmers 65 and older than there are farmers 34 and under, according to one study. This has many industry watchers concerned about the future of American farming. A farmer drives a combine while harvesting soybeans. "It's a dangerous situation," said Milt McGiffen, a professor and researcher of sustainable agriculture at the University of California, Riverside. "The aging of American farmers coupled with fewer students in agriculture studies and the fact that so many younger people don't look at it as a profession to get into is very worrisome," he said. "We're not doing enough to solve the problem." Reasons for the scarcity of young farmers are easy to find. High farm profits have kept some older farmers working longer, say analysts, creating a slower turnover to a younger group. But also keeping the younger generation at bay is the price of doing business, said Jay Jackman, executive director of the National Association of Agricultural Educators, an advocacy group for agriculture education policies. "Unless you inherit a farm, start-up costs for one are quite high," argued Jackman. "You've got to buy the land, the equipment, find buyers for your product. It's very hard work. Plus there's always the uncertainty of the weather. It's not an easy life." Thirty-year-old Leighton Cooley, who runs a poultry farm in Roberta, Ga., said being a farmer requires wearing many hats that don't fit everyone. "It's a hard business," said Cooley, who is the fourth generation of his family to farm. "It takes a lot of financial investment and you have to be a boss, manager and businessperson as well." UC Riverside's McGiffen said the burden of trying to keep the public's food supply safe, and other government regulations, make farming almost prohibitive in today's world. "There's too much paperwork and not enough of a free market to make it profitable to farm these days," argued McGiffen. Carter agreed. "I think they could cut down on the regulations," said Carter. "When it comes to safety, people have to realize we're growing this food for ourselves as well as others, so we have our own incentives to make it safe." 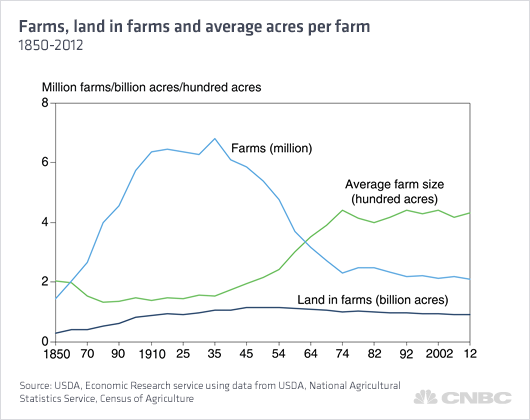 After peaking at 6.8 million farms in 1935, the number of U.S. farms fell sharply until leveling off in the early 1970s, according to the USDA. The number of farms in the U.S declined by 4 percent between 2007 and 2012. About 2.1 million farms are in operation today. Falling farm numbers reflect growing productivity in agriculture and increased nonfarm employment opportunities. Future job opportunities in agriculture seem to come at the expensive of being a farmer. According to the USDA, 15 percent of all jobs created in the U.S. between 2010 and 2015 will be in agriculture and forestry production. But the USDA expects fewer commercial farm and ranch operators to be in existence by 2015 than there are now—and a majority of jobs will be along the lines of agriculture specialists and crop management consultants. "Most opportunities for young people in agriculture are what happens off the farm," said NAAE's Jackman. "Because of that, we're in danger of not having enough farmers in the future." Despite the gloomy forecast, there are efforts to bring in a younger generation. As part of the 2014 farm bill, U.S. Agriculture Secretary Tom Vilsack this week announced new incentives to bring more people into farming. Meanwhile states like Connecticut offer training programs for first-time farmers, with an emphasis on local food production. Nebraska offers tax breaks for landowners who lease to new farmers. The efforts seem to be paying off. Connecticut has seen a 52 percent increase in farmers 34 and under from the years 2007 to 2012. Nebraska had a 42 percent increase in farmers 34 and under during the same time period. High schools and colleges in rural as well as urban areas across the country are beefing up or actually starting agriculture education programs to expose more young people to farming. 'We need to make it easier for people to farm and ideas like these help," said UC Riverside's McGiffen. "But a lot more has to be done to bring in younger farmers." Another thing that may help bring in younger farmers is better access to high technology that's lacking now, said Zach Hunnicutt, a 32-year-old farmer with some 2,500 acres in Gilpner, Neb. "Having a speedy Internet is necessary in farming," said Hunnicutt, who grows soybeans, corn and popcorn. "Being able to use your tablet or smartphone out in the fields is crucial. And listening to some good music on your devices makes the day go better." To help find the younger generation, the current crop of 30-year-olds have become recruiters for their profession. "I think it's cool to be a farmer again. I would want my kids to be farmers if they so choose," said Cooley, who is one of five farmers to be featured in an upcoming documentary about the lives of young farmers called "Farmland." "With the world needing so much food, we need younger farmers," added Carter. "I would recommend it to anyone."